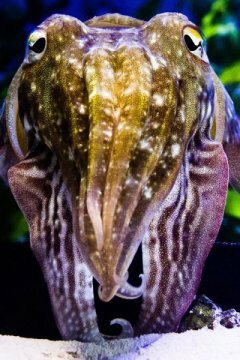 Computational image analysis of behaving cuttlefish reveals principles of control and development of a biological invisibility cloak. The unique ability of cuttlefish, squid and octopuses to hide by imitating the colors and texture of their environment has fascinated natural scientists since the time of Aristotle. Uniquely among all animals, these mollusks control their appearance by the direct action of neurons onto expandable pixels, numbered in millions, located in their skin. Scientists at the Max Planck Institute for Brain Research and the Frankfurt Institute for Advanced Studies/Goethe University used this neuron-pixel correspondence to peer into the brain of cuttlefish, inferring the putative structure of control networks through analysis of skin pattern dynamics. Cuttlefish, squid and octopus are a group of marine mollusks called coleoid cephalopods that once included ammonites, today only known as spiral fossils of the Cretaceous era. Modern coleoid cephalopods lost their external shells about 150 million years ago and took up an increasingly active predatory lifestyle. This development was accompanied by a massive increase in the size of their brains: modern cuttlefish and octopus have the largest brains (relative to body size) among invertebrates with a size comparable to that of reptiles and some mammals. They use these large brains to perform a range of intelligent behaviors, including the singular ability to change their skin pattern to camouflage, or hide, in their surroundings. Cephalopods control camouflage by the direct action of their brain onto specialized skin cells called chromatophores, that act as biological color "pixels" on a soft skin display. Cuttlefish possess up to millions of chromatophores, each of which can be expanded and contracted to produce local changes in skin contrast. By controlling these chromatophores, cuttlefish can transform their appearance in a fraction of a second. They use camouflage to hunt, to avoid predators, but also to communicate. To camouflage, cuttlefish do not match their local environment pixel by pixel. Instead, they seem to extract, through vision, a statistical approximation of their environment, and use these heuristics to select an adaptive camouflage out of a presumed large but finite repertoire of likely patterns, selected by evolution. The biological solutions to this statistical-matching problem are unknown. But because cuttlefish can solve it as soon as they hatch out of their egg, their solutions are probably innate, embedded in the cuttlefish brain and relatively simple. A team of scientists at the Max Planck Institute for Brain Research and at the Frankfurt Institute for Advanced Studies (FIAS)/Goethe University, led by MPI Director Gilles Laurent, developed techniques that begin to reveal those solutions. Cuttlefish chromatophores are specialized cells containing an elastic sack of colored pigment granules. Each chromatophore is attached to minute radial muscles, themselves controlled by small numbers of motor neurons in the brain. When these motor neurons are activated, they cause the muscles to contract, expanding the chromatophore and displaying the pigment. When neural activity ceases, the muscles relax, the elastic pigment sack shrinks back, and the reflective underlying skin is revealed. Because single chromatophores receive input from small numbers of motor neurons, the expansion state of a chromatophore could provide an indirect measurement of motor neuron activity. "We set out to measure the output of the brain simply and indirectly by imaging the pixels on the animal's skin" says Laurent. Indeed, monitoring cuttlefish behavior with chromatophore resolution provided a unique opportunity to indirectly 'image' very large populations of neurons in freely behaving animals. Postdoc Sam Reiter from the Laurent Lab, the first author of this study, and his coauthors inferred motor neuron activity by analyzing the details of chromatophore co-fluctuations. In turn, by analyzing the co-variations of these inferred motor neurons, they could predict the structure of yet higher levels of control, 'imaging' increasingly more deeply into the cuttlefish brain through detailed statistical analysis of its chromatophore output. Getting there took many years of hard work, some good insights and a few lucky breaks. A key requirement for success was to manage to track tens of thousands of individual chromatophores in parallel at 60 high-resolution images per second and to track every chromatophore from one image to the next, from one pattern to the next, from one week to the next, as the animal breathed, moved, changed appearance and grew, constantly inserting new chromatophores. One key insight was "realizing that the physical arrangement of chromatophores on the skin is irregular enough that it is locally unique, thus providing local fingerprints for image stitching" says Matthias Kaschube of FIAS/GU. By iterative and piecewise image comparison, it became possible to warp images such that all the chromatophores were properly aligned and trackable, even when their individual sizes differed -- as occurs when skin patterns change -- and even when new chromatophores had appeared -- as happens from one day to the next as the animal grows. With insights such as this one, and aided by multiple supercomputers, Laurent's team managed to meet their goal and with this, started peering into the brain of the animal and its camouflage control system. Along the way, they also made unexpected observations. For example, when an animal changes appearance, it changes in a very specific manner through a sequence of precisely determined intermediate patterns. This observation is important because it suggests internal constraints on pattern generation, thus revealing hidden aspects of the neural control circuits. They also found that chromatophores systematically change colors over time, and that the time necessary for this change is matched to the rate of production of new chromatophores as the animal grows, such that the relative fraction of each color remains constant. Finally, from observing this development they derived minimal rules that may explain skin morphogenesis in this and possibly all other species of coleoid cephalopods. "This study opens up a large range of new questions and opportunities," says Laurent. "Some of these concern texture perception and are relevant to the growing field of cognitive computational neuroscience; others help define the precise link between brain activity and behavior, a field called neuroethology; others yet help identify the cellular rules of development involved in tissue morphogenesis. Finally, this work opens a window into the brain of animals whose lineage split from ours over 540 million years ago. Cephalopod brains offer a unique opportunity to study the evolution of another form of intelligence, based on a history entirely independent of the vertebrate lineage for over half a billion years."